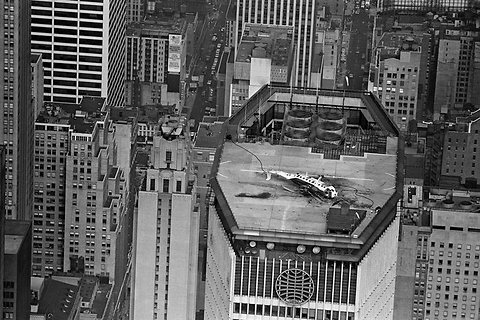 16 May 1977: At approximately 5:32 p.m. Eastern Standard Time, New York Airways Flight 971, a Sikorsky S-61L helicopter, landed at the Pan Am Building rooftop heliport (JPB) in New York City. Flight 971 had originated at John F. Kennedy International Airport (JFK) and carried 20 passengers and a crew of three. The helipad was 855.23 feet (260.67 meters) above Sea Level. In the cockpit’s right seat was Captain Lee G. Richmond. Captain Richmond had 11,721 total flight hours with over 9,000 in helicopters and approximately 2,200 in the Sikorsky S-61. He had worked for New York Airways since 1964. The co-pilot was First Officer John F. Flanagan had worked for NYA for about five weeks. He had 1,768.4 flight hours with 1,339.2 hours in helicopters. Both pilots had flown 3 hours, 33 minutes on 16 May. Flight Attendant Lammie Chevalier had been employed by NYA for four years. Captain Richmond taxied the S-61 into position on the 131-foot × 131-foot (39.9 × 39.9 meters) concrete helipad. While parked at the gate, Richmond kept the rotors turning at 100%, keeping the cyclic control centered and the collective full down (negative pitch). The Automatic Flight Control System (AFCS) was engaged. Flanagan kept his left knee against the collective pitch lever to ensure that it remained full down. Flight Attendant Chevalier stood inside the passenger cabin, supervising departing and boarding passengers. The return flight to JFK was designated Flight 972. 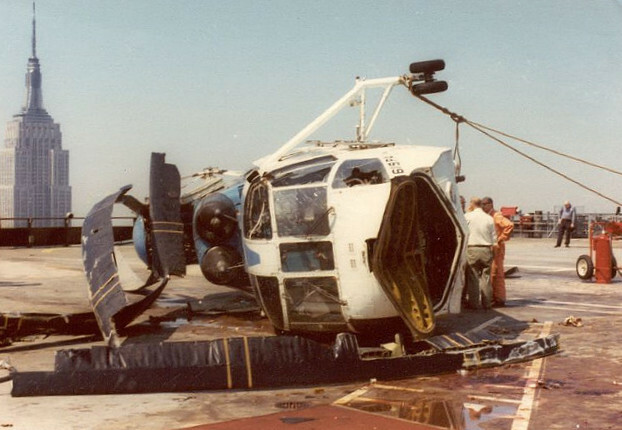 2 minutes, 21 seconds after touch down, at approximately 5:35 p.m., the right main landing gear of the helicopter failed and the S-61 rolled over to the right. All main rotor blades struck the concrete helipad. Four passengers who were waiting to board were struck by the blades and killed. One of the blades, 28 feet, 10 inches (8.787 meters) long and weighing 209.3 pounds (94.9 kilograms) flew out over the building’s railing and fell alongside the building before crashing through an office window on the 36th floor. The main rotor blade broke into two segments, one of which fell to the street below, striking a pedestrian and killing him. 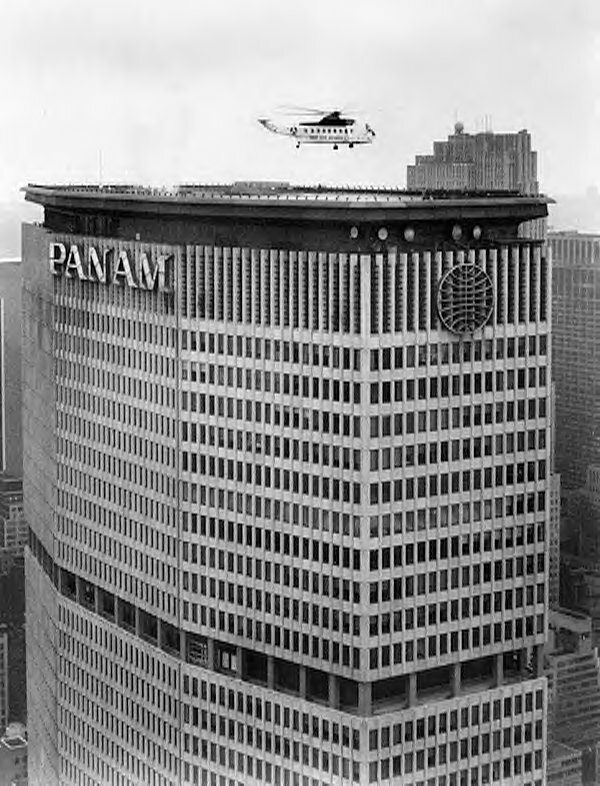 Additional pieces of the main rotor blades were found up to four blocks north of the Pan Am Building. 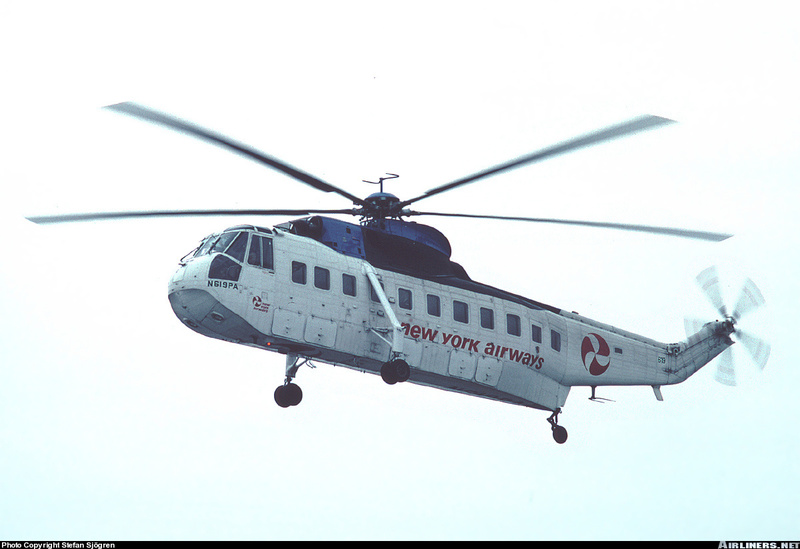 The helicopter assigned to Flight 971/972 was a Sikorsky S-61L, s/n 61427, registered N619PA. At the time of the accident, the helicopter had a total of 6,913:15 hours on the airframe. Just 7 hours, 22 minutes had elapsed since the last major inspection. The NTSB determined that the flight crew had performed correctly, and that the aircraft was properly certified, maintained and operated. The Board speculated that the four boarding passengers would have been killed by the helicopter rolling over, even if the engines had been shut down and rotors stopped. 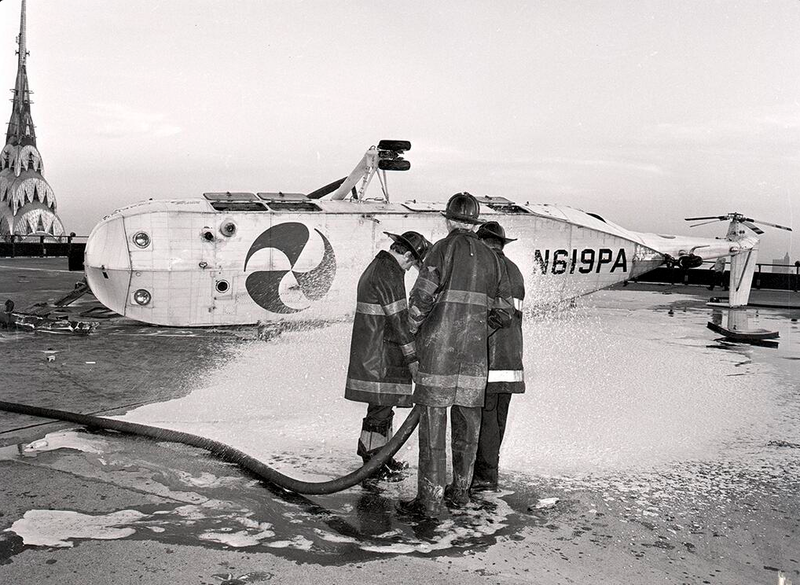 A similar accident had occurred when a Los Angeles Helicopters Sikorsky S-61L suffered a fatigue fracture of its right landing gear and rolled over at Los Angeles International Airport (LAX) in 1963. This accident had resulted in a change in the material used to manufacture the parts. The Sikorsky S-61L was a civil variant of the United States Navy HSS-2 Sea King, and was the first helicopter specifically built for airline use. The prototype, N300Y, first flew 2 November 1961. It is a large twin-engine helicopter with a single main rotor/tail rotor configuration. Although HSS-2 fuselage is designed to allow landing on water, the S-61L is not amphibious, having standard fixed landing gear rather than the sponsons of the HSS-2 (and civil S-61N). The S-61L fuselage is 4 feet, 2 inches (1.270 meters) longer than that of the HSS-2. The S-61L is 72 feet, 7 inches (22.123 meters) long and 16 feet, 10 inches (5.131 meters) high, with rotors turning. N619PA was powered by two General Electric CT58-140-2 turboshaft engines, each of which had maximum power rating of 1,400 shaft horsepower for takeoff and 1,500 SHP for 2½ minutes. The main transmission was rated for 2,300 horsepower, maximum. The S-61 has a cruise speed of 166 miles per hour (267 kilometers per hour). The service ceiling is 12,500 feet (3,810 meters). The maximum takeoff weight is 20,500 pounds (9,298.6 kilograms). Between 1958 and 1980, Sikorsky built 794 S-61 series helicopters. 13 were S-61Ls. As of May 2017, two remained in service.